Note: Reports claim that GTA V PS4 version will be launched before the Xbox One version as timed-exclusive with pre-order bonus content, you can check out the complete story here. There are some games out in market that many gamers want to go through again on their latest consoles and PC, and Rockstar’s GTA V is one of them. Being washed with the next-gen technology, the upcoming remastered version of GTA V is many times claimed to be a lot more than just another title that has been redone for the latest consoles and PC. Besides enhanced visuals and dynamic in-game environments, the game will come packed with exclusive additional content, which means it will be much larger in size, and this screenshot that recently emerged on internet tells just that, showing that the game requires 50GB of minimum HDD space on PlayStation 4 console. Releasing on PC, PlayStation 4 and Xbox One, the remastered version of 2013’s hit open world action-adventure video game title is something that everyone has been longing for. The upcoming game features enhanced visuals, textures and character optimizations that all combine to offer much more immersive and engaging gameplay. To make the package more attractive, the developer is also adding additional features that were not available on the last-gen version of the game, such as new vehicles, weapons, realistic wildlife and city activities. Of course, all these good things would not come in small size, in fact, according to the screenshot that recently popped up on the internet, it looks like GTA V is going to be the biggest video game title on the PlayStation 4 so far with an install and save size of 50GB. The screenshot, which was provided by a user over at the GTAForums, is of the pre-order page of the game on European PS Store, and along with some other details, it reveals that the minimum HDD space required to save the entire game on PlayStation 4 console is 50GB. You can check out the screenshot below. 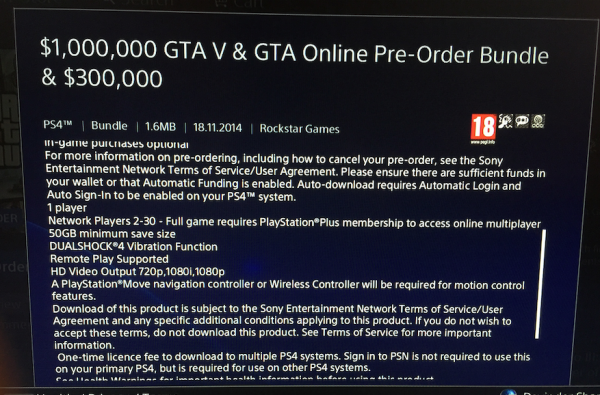 This means GTA V is going to cover up about 1/10 of your PlayStation 4’s standard 500GB HDD. Comparing the game’s 50GB save size to one of the PlayStation 4’s most boasted exclusive; Killzone: Shadow Fall requires around 37GB of the HDD space, and Wolfenstein: The New Order, which was the largest PlayStation 4 game in terms of size until now, takes around 48GB of the total space. The PlayStation 3 version of the game is only 18GB in size, which means that if the upcoming remastered version is covering up this much space, it must be coming crammed up with a lot of good stuff. 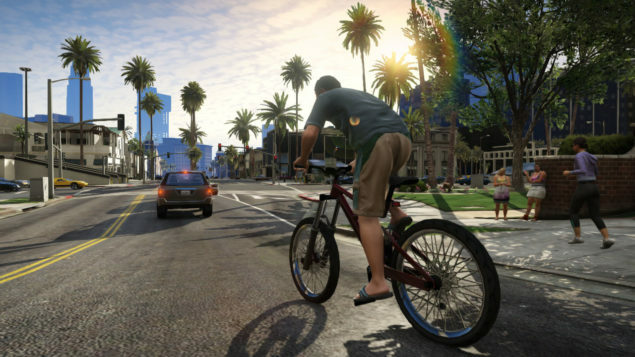 GTA V is set to launch on November 18 for PlayStation 4 and Xbox One, and on January 27 for PC. The game will reportedly feature first-person gameplay mode and much more. Stay tuned for more news on the title.